Dream Blend for Machines is 70% Cotton blended with 30% Fine Denier Poly Microfibers creating the perfect batting especially developed for machine quilting. The highest grade of USA cleaned natural cotton is blended with our silky fine denier polyester microfibers. These perfectly blended fibers are carded and cross-lapped for a smooth consistent web that is layered on to a light scrim and specially needle punched. 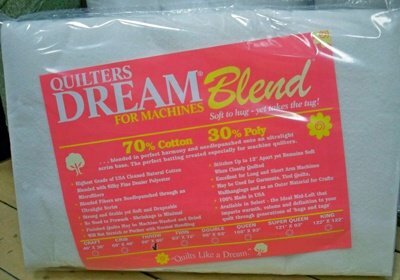 Dream Blend for Machines is made with the same distinctive quality, cleanliness and consistency that has made Quilters Dream Batting the one you can always count on! Made with pride in the USA. Natural Cotton - the highest grades of upland USA natural cotton. We start with nature's cleanest cotton and then mechanically clean the cotton to practically eliminate any remaining seed or leaf particles. Polyester Microfibers - "not polyester as usual". Fine silky fibers imitate natural fibers in softness, drape and breathability and impart volume to cotton allowing for easier washable, quicker drying and reduced shrinkage. Ultralight Poly-pro-ply-ene Scrim - an ultralight thin base that the cotton/poly fibers are needle punched through. This base adds a layer of stabilized strength that allows the extra "tug" or "pull" and helps reduce any "hand prints", stretch or puckering as you are working with the batting. Scrim has a melt point of 250F. To maintain the soft suppleness of your quilt, dry on low temperatures, do not use a commercial dryers and use a low iron setting. If you dry-clean your quilt, advise your cleaner. Special processing - we use state of the art manufacturing. The fine denier poly and cleaned cotton fibers are opened, combed, blended and carded. To add extra strength and prevent "naps", we go another step and cross-lap the fibers into a fine consistent web or pad. This is layered with the scrim and specially needle punched using thousands of saw like needles that interlace the fibers through the soft scrim base. Commitment to Excellence and Quality Control. - Quilters Dream products are hand-cut and carefully inspected by our "Dream" team. We value the art of quilting and take great care in bringing you unsurpassed quality. Quilters Dream proudly presents premium batting that will provide warmth, volume and support to your quilt through generations of "hugs and tugs".